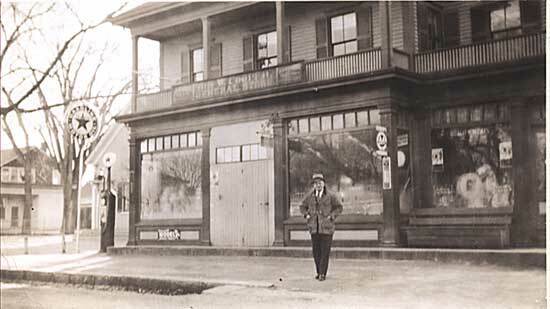 Guy W. Cooper inherited the store from his uncle Anse in 1903. The picture above shows the store, with Guy, standing in front, with Wellingsley School (center) and Wellingsley Union Chapel (far left). By 1938 (below) the store had been enlarged again with a wing to the north which housed the meat market (right), and the chapel had been converted into a dwelling. 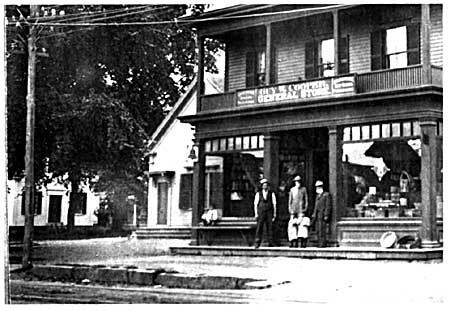 George W. Long came to Plymouth to write an article on the town for the National Geographic which was published in the August 1947 issue, and visited the store: "Before you leave Plymouth," I was advised, "see Guy Cooper at Jabez Corner. He runs a real old-fashioned general store. Always prided himself on having anything anyone asked for; that is before the war he did. " They told me of the summer resident who thought to stump Guy by asking for a pulpit. Without a word, the old storekeeper led him to the barn, showed him one of the staunchest oak. "Got her from the church down the road they took down some time ago," he explained. "Thought some darn foold ask for it." The store, 150 years old, with 14 additions to its original building, sprawled back from the Cape road in accumulated abandon. Inside, a confusion of merchandise was heaped on counters and shelves. Many of the articles I hadnt seen in years. "Know where everything is?" said Guy. "Sure I do. Ought to. Ive tended store here for more than 60 years. Want to see around?" We did "see around," talking of storekeeping, its trials and tribulations. Ocscasionally the tinkling front door bell sounded, and Guy would hurry off to get a quart of milk or a pennys worth of candy. "Now heres where the nailkeggers gather, winter nights," he said when we reached the back room. There they were--a dozen kegs and a fat, pot-bellied stove. "Most people think things is run from Washington. Aint, though. Right heres where everythings settled. These fellers always leave in a body, too. Anyone leaving before the rest naturally loses his argument." Business picked up, so I sat on a sack of grain and played with four frisky kittens. Plenty of good-natured fun crossed the counter with money and goods. "Ever try these?" Guy asked a summer customer, pointing to a dozen fluffy buns wrapped in cellophane. "Are they good?" she countered, rising to the occasion. "Dont know. Never et any," came the brisk reply. 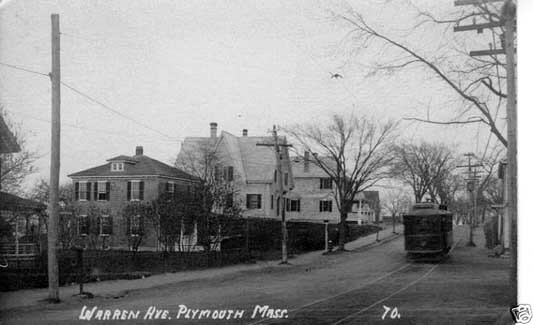 The Brockton and Plymouth Street Railway car entering Warren Avenue, next to Bradford's store (original location), ca. 1910.